Robert Tonner Catalogs - 2007-2008 Tonner/Effanbee Fall/Holiday dual catalog - brand new - straight from Tonner packing carton. Includes descriptions; original retail prices and edition sizes. 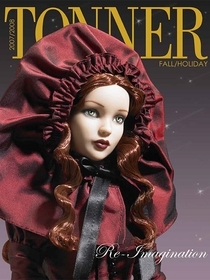 Beautiful catalog printed on glossy, high quality paper - full of beautiful color photos of all dolls, outfits and accessories in the 2007-2008 Fall-Holiday (early into next year preview) Tonner & Effanbee Doll Company collection. The front section of the catalog is 41 pages of fabulous poses, details and original retails prices. The collections covered include Tyler Wentworth; New York City Ballet; Alice in Wonderland; Wizard of Oz; Agnes Dreary; KickIts; Pirates of the Caribbean; The Hardy Boys; Nancy Drew; Mary Poppins; Gone With The Wind; Harry Potter; Charles Dickens' A Christmas Carol; Re-Imagination; Tiny Kitty and The Basics - Basic Dolls from all of Robert's covets collections that years. Flip the catalog over and upside and you have the beautiful Effanbee Holiday Catalog which was also the farewell to the iconic Brenda Starr. The Effanbee collection was small but special with a beautiful collection of Brenda Starr and Daphne Dimples in exquisite evening gowns and even casually dressed Brenda and St. John ready for an undercover assignment in Havana. Includes Effanbee Baby; American Child and Katie; Mrs. Willowby's First Grade Class.